“Be proud to join the circus! Step right this way and join the circus!” echoed the finale number of Cameron Mackintosh’s 2014 touring revival of Cy Coleman’s ‘Barnum’. As an abundance of excited theatre goers did indeed ‘step right this way’ to take their seats, the auditorium filled with an array of skilled circus performers who juggled, tumbled, clowned and cartwheeled in the aisles, building just the right of pre-show momentum and carnival atmosphere required to kick start this flamboyant circus musical production. ‘Barnum’ focuses it’s narrative on the irrepressible creativity and dreams of Phineas Taylor Barnum, the legendary entertainer and businessman who lit up the world with the colour, warmth and excitement of his imagination. The production charts his life from his marriage to wife Chairy, who helped him achieve his dreams, to the creation of the world’s first traveling circus extravaganza - ‘Barnum and Bailey's Circus – the Greatest Show on Earth’. Of course, the success of ‘Barnum’ relies heavily on the actor brave enough to take on the leading role of showman PT Barnum himself. 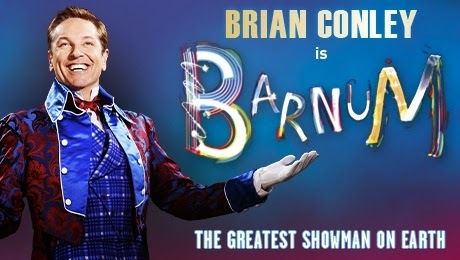 Headliner Brian Conley proves the perfect match, carrying the audience in the palm of his hand from start to finish as he takes his audience on Barnum's colourful, jovial and often poignant emotional journey. Although seemingly riddled with the cold, Conley defiantly proves ‘the show must go on’ and puts on a stellar, if a little croaky (at times) performance. Even the few magical mishaps didn’t detract from his portrayal and instead made hischaracterisation all the more endearing. Imagine walking a tightrope whilst sporting a nauseating cold? A showman within a showman. Terrific. Supporting Conley was the irresistible West End and Broadway star, Linzi Hateley who gave a heartfelt and honest performance as forgiving wife Chairy Barnum - a complete contrast from her energetic leading man but a portrayal that successfully tapped into the emotional core of Barnum’s narrative. On a lighter more comedic note, special mention must go to Landi Oshinowo who gave a spirited yet charming performance of ‘Thank God I'm Old’ as Joice Heth – the oldest woman in the world! Oshinowo’s vocals were superb, a quality she continued to channel as the Blues Singer in act two’s ‘Black and White’. Scott Pask’s set is impressively eye catching yet simple with wrought iron staircases and a circus wagon skillfully employed to ensure the narrative progressed smoothly yet effectively, and complemented by Paule Constable’s atmospheric and intelligent lighting design. Similarly, Choreographer Andrew Wright’s movement was slick, dynamic and perfectly gymnastic showcasing the scope of talent amongst the ensemble cast who proved they could juggle, showcase aerial work, perform acrobatics tricks and eat fire while carrying out Wright’s intricate choreography. 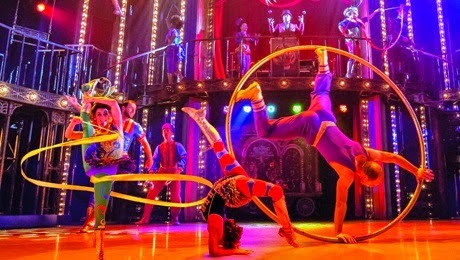 Musical Director Ian Townsend must also be commended for his small but perfectly formed on-stage live band, who were spot on acoustically and instrumentally throughout the production, giving each number just the right amount of pizzazz necessary for a high-flying circus extravaganza. Across the board, ‘Barnum’ is a supreme spectacle - visually, acrobatically, musically and of course, buzzing with theatrical vigor. You’d be walking a very thin tightrope to consider missing this one. 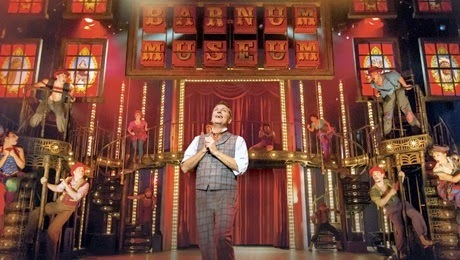 “Bigger isn’t better, smaller isn’t braver”… but ‘Barnum’ is bloomin’ marvelous.